One of the biggest dilemmas athletes face is how to identify an injury, care for it properly, and return to former performance levels quickly. The way we handle the setback determines the downtime duration, our fitness upon return, and the likelihood of experiencing the same injury in the future. Let’s decipher the injury puzzle step by step. Injuries aren’t always painful, though they are always damaging and inhibit our ability to ‘play.’ We commonly envision soft tissue or bone injuries such as stress fractures, tendonitis, or muscle tears. However, there are injuries that X-rays and MRIs cannot confirm: chronic fatigue, the flu, blood disorders, and hormone-related issues that disrupt our capability to train and race. They often go untreated for long periods of time because we can still run. How Do I Know I’m Injured? 1. The act of running should not be a painful activity. A healthy body’s feet, hamstrings, knees, back, and so on should not hurt when jogging down the block. If they do, then you have a deficiency that needs to be addressed. 2. Understand the difference between adaptive and restrictive damage. Adaptive damage is beneficial. This is the ‘good’ pain we associate with running. It occurs when we speed up, increase our effort, or charge up or down a hill. Our lungs and legs burn and, as a result, we experience delayed onset muscle soreness and fatigue following the workout. This is how our body absorbs and adapts to tough training in order to reduce further damage in subsequent workouts. Restrictive damage isn’t good. This is an injury. Watch for impairments to your running gait, swelling, discoloration, persistent or asymmetrical soreness, aching, sharp pain, constant fatigue, abnormally high heart rate, loss of appetite, and lack of power. These are not symptoms to ignore and simply ‘run through.’ The body can’t efficiently or appropriately remedy this type of damage without outside assistance. 3. Running shouldn’t negatively affect the other aspects of your life. Of course, when we’re in the meat of a training cycle, fatigue is always a factor. However, this weariness shouldn’t disrupt your relationship with family and friends, impair work productivity and performance, or leave you under the weather. Okay, something isn’t quite right, but how do you make a quick return to issue-free training? Acknowledging the presence of a problem is the most important step in the recovery process. Cease the activity or level of activity that causes the abnormal symptoms. Continuing to train with an injury can lead to greater harm and a longer rehabilitation time. Do not self-diagnose. Not all information sources (anecdotal or Internet-based) are accurate when determining injuries or their treatments. Seek the assistance of a specialist. Understandably, this can be a scary proposition due to cost or what treatment might entail. However, if you find an expert who is an athlete and comes recommended by the running community, most common running injuries, if caught early enough, won’t require an expensive work-up and much of the treatment can be done on your own. 1. Be patient and maintain an optimistic outlook. 2. Stay as active as possible. Continue to reproduce your running routine in terms of time, intensity, and frequency with the optimal piece of equipment. Maintaining your aerobic fitness in this way will ensure that the transition back to running is easier and will produce mood-enhancing endorphins while you’re rehabbing your injury. Both Gregg and Waldberg focus on several form traits during their examinations. Waldberg says, “Once I work with a runner to quicken their cadence most pains subside and efficiency returns.” Count how many times one foot hits the ground in 30 seconds. It should be about 45 times. Waldberg, who’s analyzed the form of more than 3,000 runners, has discovered that anything less than this will inevitably lead to form mistakes and injury. Listen to the sounds you make when you run. Eliminate any pounding or slapping upon impact. Imagine that the earth you’re running on is very hot. Play with your own form to discover the best way to land quietly. How Do I Know When I Can Start Running Again? Begin by walking for 45 minutes without difficulty. Once you can do this, then run a mile on a soft, flat surface. If there are no ill effects, then the next day run two miles. Progress a mile/day, up to five miles. Finally, if you have done all of the above issue-free, you can compete again. What Do I Do If I’m Continuously Sidelined? Training – Assess weekly volume and intensity. Identify patterns linked to injuries and training load. Form – Get the running-gait analysis described above to determine if a simple form change will reduce injury rate. Strength – Running-specific strengthening exercises can retrain lazy muscles to work efficiently and quickly fatigued muscles to act with more power, build trunk stability, and fine-tune motor skills. Common examples are core exercises (planks, crunches, side-lying single-leg lifts), balance exercises, squats, jump rope, and lunges. Flexibility – Active isolated stretching, the act of contracting one muscle to allow the opposing muscle to relax and lengthen. This increases range of motion and promotes circulation. Footwear – Check the wear and tear on your shoes. Experiment with different shoe weights, heel-to-toe drops, cushioning, and flexibility. Diet – Proper nutrition is the primary building block of our health. Without it our ability to train, perform, and recover crumbles. “Sometimes an injury can be the worst best thing that could have happened,” concludes Gregg. Don’t view an injury as a setback, but rather as a learning opportunity. Use the recovery time to strengthen weaknesses, uncover training mistakes, and determine your limits. You’ll come out on the other side a smarter athlete and less likely to fall into the same injury pattern. Does any of this advice ring true for you in the recognition of a niggle or injury you might currently have? And, for those of you who are recovering or have recovered from injury, have you been through any of the processes Ian describes here? Allright, Iam injured. Their I said it. Thanks for the wake up. Fantastic article on injury, in general. I am a sports-med focused podiatrist and trail runner and I have already given this article out to multiple patients. It is comprehensive in addressing the psychology of injury which includes acceptance and recognition. As a practitioner, I don't focus on 'NO' I focus on alternate activity and the fact that this injury can be a teacher. Look closely at your biomechanic and physiologic weaknesses. Address them, work on them, take the time and effort you once put into training to correct these flaws that may contribute to future injury. As competitors we visualize on success, improvements, training. We are good at training in 'the now' but not as good at living 'in the now' when we are injured. The visualization should focus from races and training to our own weaknesses and how to improve them. And then, when we are better, to a SLOW progression to full training and competition. Cheers, fantastic article! Hello! I just posted an entry referencing my meniscal tear. To give a little more info, it was not a 'good' tear as my surgeon described. It was very close to the root but they did repair it. That was about 6 weeks ago, however, the more serious issue is related to cartiledge detachment and deterioration. I've spent this time easing back into run, actually no road running at all, just walking. 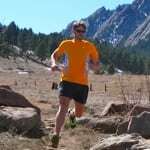 Trail running 2-3 times a week, PT 1-2x/week and strength training 3-5x/week (mostly the exercises I do at PT but some weights in the gym also). I've also increased treadmill running with the incline at 10% or more which forces me to go very slow but provides a great workout. I'm very happy to be able to do about 2 hours without knee pay (very slow and walking down hills) on the trail compared to 3 months ago not being able to do more than 20 minutes without significant pain. I'm 43, thinking I'm 23 and paying the price. Good luck to a speedy recovery! Great article Ian! I was late in accepting #1 & 2 from recognizing a knee injury last fall while increasing my training volume and intensity. While I did back off somewhat, I continued to come back and train harder; exactly what I should not have done. Eventually, after increased pain and misery, I finally saw an excellent sports orthopedic and found out I had a torn meniscus and detached cartilage. After surgery in Feb, I'm well on my way to recovery and happy to report I can do up to 2 hours of pain free trail running in the AZ desert. It's good to see I'm following nearly all the advice in the article and progressing both physically and mentally.